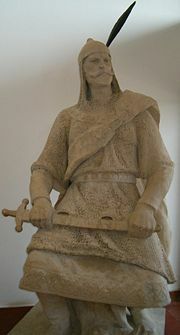 Árpád (c. 845 – c. 907) was the second Grand Prince of the Magyars (c. 895 – c. 907). Under his rule the Magyar people moved from Etelkoz to the Carpathian basin. The dynasty descending from him ruled the Magyar tribes and later the Kingdom of Hungary until 1301. While he is not the father of Hungary, he did establish the dynasty that would shape the life of the Magyar people for several centuries. He may have been spiritual as well as temporal leader; this period was before the Hungarians converted to Christianity towards the end of the tenth century. There is some speculation that lack of reference to Árpád in contemporary Western sources may be because he was in fact the spiritual rather than political head of his people. His descendant, Stephen I of Hungary, canonized as Saint Stephen, became the first King of Hungary in 1001 ending the succession of Grand Princes. A total of eight members of the dynasty became saints; others members have been beatified. In many respects, the Hungarians remained no respecter of borders, continuing to settle in neighboring land. Themselves of Turkic origin, under Árpád they settled in a border zone between East and West, where, over the years, they have helped to bridge different cultures and peoples; "Hungary's special characteristics are rooted in this history of fluid borders, as well as the strong migratory tendencies of people of Hungarian ancestry who are citizens of neighboring countries." Although comparatively little is known about the life of Árpád, his role in leading his people through the dangerous Verecke Pass, said to be littered with graves from this period, is immortalized in the memory of his people. Árpád was the son of Prince Álmos, leader of the Hungarian tribal federation based in Etelkoz, where they had migrated from their homeland to the East of the Urals; his mother's name and descent is unknown. According to Hungarian tradition, he was descended from Attila the Hun, possibly his great-great-grandchild. Before 862, the seven Magyar tribes, living in the area they called Etelköz, seceded from the Khazars; afterwards, they were exacting tribute from the neighboring Slavic tribes and they fought occasionally as mercenaries on behalf of King Carloman of Bavaria, King Arnulf I of Germany and King Svatopluk I of Great Moravia. The Hétmagyar confederation was strengthened when three tribes of the Kabars, who had rebelled against the Khazars, joined them before 881. By 894, the Magyars were strong enough militarily to offer support to the Byzantine Empire despite being subject to the suzerainty of the Khazars. Meeting with representatives of the Emperor, Leo IV the Wise, Árpád negotiated for his father the terms under which the confederation of the Magyar tribes was willing to assist the Byzantine Empire against Emperor Simeon I of Bulgaria. In the spring of next year, the Magyar tribes attacked the Bulgarian Empire and defeated Emperor Simeon I, forcing him to conclude peace with the Byzantine Empire. Emperor Simeon, however, entered into an alliance with the Pechenegs instead, who were the eastern neighbors of the Hungarian tribal federation, and he then attacked the Magyar troops. In the Battle of Southern Buh, Emperor Simeon I defeated their army; shortly afterwards, the Pechenegs attacked as well and pillaged their territories. The Magyar tribes were obliged to move through the Verecke Pass to the Carpathian Basin, where they settled (Honfoglalás).. This completed the Magyars long migration form their original homeland, to which they refer as Urheimat. The exact location is unknown but it was probably to the East of the Urals. The Magyars migration and occupation of what they refer to as "our country". The circumstances of Álmos' death in 895 are unclear. He may have been assassinated or even offered as a human sacrifice to atone for losing the war. The leaders of the seven Hungarian tribes proclaimed Árpád as Grand Prince of the Magyars making him the first to hold this title (although his father is sometimes referred to as the first Grand Prince. ); therefore Árpád is considered traditionally to have lead the Honfoglalás, "the occupation of the country." Árpád and the six other chieftains of the Magyars. From the Chronicon Pictum, 1360. In 896 the Hungarian tribes occupied the Upper Tisza river, from there they undertook numerous looting raids in central and western Europe, and in 900/901 they moved to Pannonia. The Magyars entering the Pannonian fields in 896 may have represented about 200,000–250,000 people. Based on Arabic sources, Árpád's title, like his father's, seems to have been kende or gyula. In that time kende was the spiritual leader of the Magyar tribes, while the gyula led their military campaigns. According to legends, Árpád held the first "parliamentary" session with 40 other "nobles" on horseback before 900 C.E. According to Lázár, "Before and during the conquest, the tribal separation was still pronounced, but now—largely under Árpád's influence—the tribes became increasingly united and combined into a tribal confederacy." Although he is not considered the founder of the Kingdom of Hungary—that was his descendant Stephen I—he is generally thought of as the forefather of Hungarians and is often affectionately mentioned as our father Árpád. Árpád was the founder of the dynasty named after him, which would rule over the kingdom of Hungary until 1301. It was Árpád's grand-son, Géza who first invited Roman Catholic missionaries to Hungary. A total of eight members of the dynasty were later canonized. A monument was built in his honor in 1896 in Budapest, known as the Árpád Memorial. ↑ Stephen Sisa, The Ancient Magyar World Hungarian History. Retrieved July 14, 2008. Sisa describes pre-Christian Magyar religion as a "blend of ancestor worship and paganism." ↑ This theory is based on the assumption that the Magyars may have shared the organization of their Khazar overlords, who divided spiritual from temporal leadership. The Khazars, who were semi-nomadic, controlled much of the North Caucasus from the seventh to the tenth centuries C.E. ↑ Judit Juhász, Hungary: Transit Country Between East and West Migration Information Source. Retrieved July 14, 2008. ↑ Stephen Sisa, A bridge Between East and West Hungarian History. Retrieved July 14, 2008. ↑ István Lázár and Thomas J. DeKornfeld (trans. ), Transylvania, A Short History 4: The Scourge of Europe (Budapest, HU: Corvina Books Ltd., 1997, ISBN 9631343332). Retrieved July 14, 2008. ↑ It is remarkable that Árpád was never mentioned by contemporary Western sources, which strengthens the idea that he was the spiritual ruler of the Magyars. ↑ Some scholars consider Kende to be the name of a person. ↑ Hebbert, Longley, and Richardson (2002), 432. ↑ Hebbert, Longley, and Richardson (2002), 385. This page was last modified on 27 July 2008, at 16:02.